I’m aware that’s a bold statement to make. I’m sure come next week I suffer a massive breakout or something because I’ve dared to say my skincare is working. However, I’ve been really happy with my routine over the past couple of months and felt it had been long enough to consider it a bit of a winner and share it! 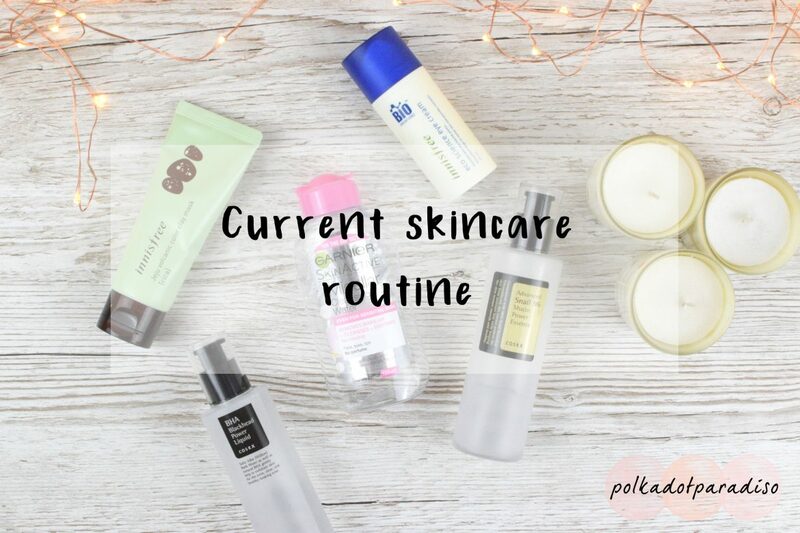 My skin has an oily T zone but can get dry very quickly if I use too harsh products on it. I also have huge pores and am acne prone. The spots can get pretty large and painful and take a very long time to truly fade. Has my skin dramatically changed? No. I still get oily patches but it’s nothing a little dab of a blotting paper won’t fix. My acne hasn’t completed disappeared, it’s still fading. I definitely still get spots but I get fewer of the big, angry ones. But overall, my skin is a lot clearer than it has been in a long time and I feel a lot more confident on make up free days. If you’ve seen any of my skincare posts before you’ll know I fell down the Asian Skincare rabbit hole last year. While I’ve been developing a routine, I’ve been tracking it in my bullet journal. I can’t imagine trying to do this without tracking it in some way. As I slowly added more products into my routine (generally it’s advised to wait at least two weeks in between product introductions) I’ve needed this to keep on top of what did and didn’t work on my skin. Now everything in my routine is settled, my tracking page looks a little cleaner. As you can see, I’m not doing the whole ’10 step routine’ as I’m not going to add extra products in unless I really feel I need it. I have one new product coming to add in – a Vitamin C serum, but that’s it. If you caught my post about ditching the double cleanse, you’ll know I’ve simplified my cleansing lately. In the morning it’s just a splash of water and in the evening it’s my Make Up Eraser followed by Micellar Water. I’d come to realise that using two thick cleansers on my face was doing nothing for it. I’d come this to this conclusion before when using heavy cleansers so I’ve no idea why I thought this time would be any different. Anyway, since switching to this, my face has calmed down loads. My current eye cream is an Innisfree one. I really like this one and have just started my second bottle. This hasn’t done anything for any lines around my eyes but it’s a lovely hydrating cream. My makeup definitely sits better now that I’ve been using this. I do need to start researching a proper ageing eye cream soon though. I have two toners in my routine – the Innisfree White Tone Up and the COSRX BHA/AHA Clarifying Toner. Initially I was using the Innisfree in the morning and the COSRX in the evening as I didn’t know how my skin would react to the COSRX. As my skin has been responding well to the COSRX, I’ve generally been using it on a morning too. While I liked the Innisfree toner to be honest I didn’t really feel like it did much. With the COSRX I know it’s got small amounts of BHA and AHA which have definitely been helping to clear my spots. I had a bit of a tricky start with actives and the first one I tried – the Mizon AHA was horrible for my skin. Upon further research I’d got a little too excited and just chose something I saw that people liked, rather than researching what actives I needed for my acne. That’s where the COSRX BHA Blackhead Power Liquid came in. Much better for getting rid of my acne and smoothing my skin. I started off slowly with this, after the problems I had with the Mizon AHA. I did two weeks of using just once a week, three weeks of twice and now I’m currently using it three times a week. As I’ve got Vitamin C on order, I’m intending to alternate Vitamin C and BHA on different days. Therefore, it’ll stick to three times a week for the time being. This is the only essence I’ve tried and I’ve got backups already bought of it. It’s the COSRX Snail Essence. This stuff is fantastic. Two pumps on this on my skin morning and night and it’s making a real difference to the fading of my spots. I love it so much I’ve started buying it for people! Once again it’s COSRX! I reviewed this recently so if you want to see an in depth review, take a look here. I like this, particularly for Winter months. However, I will be moving onto something lighter when it gets warmer. Every so often I’ve also been using the COSRX Overnight Rice Cream as it’s a little lighter than the Hyaluronic Acid one. I love a good mask, but I rarely get around to doing them. I do have a few favourites when I get chance. In terms of sheet masks, Skinfood are probably my go-to brand and green tea is my favourite ‘flavour’ at the moment. Green tea is lovely and soothing on the skin and perfect when my skin is flaring up. In terms of other masks, I’m all about the clay. I’m using up the last of a Liz Earle tube and have just purchased the Innisfree clay mask. I find clay masks freshen up and clarify my skin perfectly but only when used once a week. Anymore than that can get a bit much for my skin. Now the acne is slowing down it’s time to think about fading those old spots a bit more. I’ve read lots about Vitamin C so I’ve got the highly recommended Melano CC on it’s way. I’m going to introduce this slowly, like my other actives and hope for a good reaction!